Washington, D.C., September 24, 2014 – Today, Action for Health Justice (AHJ) released a national report detailing many of the serious gaps in resources at federal and state levels during the first Open Enrollment Period. Despite these gaps, the report captures practices and strategies used by its 70 community-based partners in 22 states that reached over 600,000 Asian Americans, Native Hawaiians and Pacific Islanders during this period. Improving the Road to Coverage: Lessons Learned on Outreach, Education, and Enrollment for Asian American, Native Hawaiian, and Pacific Islander Communities, provides a roadmap for outreach and enrollment assisters and policymakers heading into the next Open Enrollment Period to ensure those eligible get enrolled and stay enrolled in health care coverage. 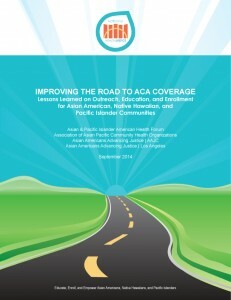 “We hope this report will drive state and federal policymakers to improve and enhance Affordable Care Act and Marketplace policies and systems so that Asian Americans, Native Hawaiians, Pacific Islanders and other underserved communities can get coverage, stay insured and use their coverage to improve their health status,” said Priscilla Huang, senior director of impact at the Asian & Pacific Islander American Health Forum, an AHJ partner organization. The report also discusses how, through concerted and dedicated efforts, AHJ in-person assisters, organizations and health centers filled in public resource gaps to reach and enroll over 600,000 individuals in 41 languages. They provided targeted, in-language education about new coverage options and walked uninsured and underinsured consumers through the application process. For example, in Federally Facilitated Marketplace states, the HealthCare.gov application portal was only available in English and Spanish. As a result, consumers who spoke other languages could not access the website as other English-speaking consumers could without assistance from organizations such as AHJ. About 1.9 million Asian Americans, Native Hawaiians and Pacific Islanders were uninsured and eligible for coverage at the start of the first Open Enrollment Period. Many of those who have yet to enroll or have enrolled will be faced with a dearth of resources available in-language and inadequate levels of assistance unless policies and programs are improved before November 15. Action for Health Justice is a coalition of more than 70 Asian American, Native Hawaiian and Pacific Islander national and local community-based organizations and Federally Qualified Health Centers dedicated to educating, empowering and enrolling AAs and NHPIs in health coverage. AHJ’s partner organizations are active in the following 21 states: Arizona, Arkansas, California, Georgia, Hawaii, Illinois, Louisiana, Massachusetts, Michigan, Minnesota, Mississippi, North Carolina, New Jersey, New York, Ohio, Oregon, Pennsylvania, Rhode Island, Texas, Utah and Washington. For more information and health reform resources in English, Asian and Pacific Islander languages, visit www.apiahf.org. Visit www.healthcare.gov for more information about the Marketplace and how to enroll.